The last few days I have been playing with the Ipad I got my wife for Christmas. 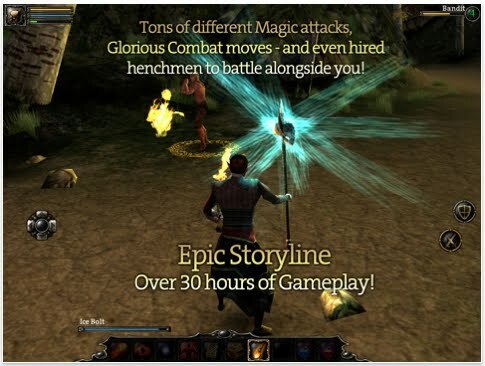 Went searching the App store for RPG games and came up with - Aralon! I must say i was very pleasantly surprised. While not as detailed or comprehensive as NWNII, it is very playable and entertaining. It has multiple classes and even a few tricks NWNII doesn't have - including ridable horses and beasts! Very cool. I can't wait to see what Ossian comes up wth for "Shadow Sun". The screen shots look fantastic, and after seeing what Aralon could accomplish, I know we are in for a real treat. I have included a simple screenshot from the app store. On the "Winter Promises" front, I have been spending time in the village of "Lakton" - a town on Mirror lake, where significant developments will take place. Have linked up the location to the world map, and am currently finishing the interiors and townfolk. Spent a wonderful crash-free afternoon. I am home from work with my wife who just underwent "minor" surgery (personally I don't think there is such a thing). She is recovering well so I had a few hours while she was napping. No pics this time - just sharing the good news that I have now fully recovered from the last crash back in October. I did a little work over the Christmas holidays, but kept running into things that had worked previously, but now weren't. I had almost resigned myself to recreating a lot of stuff when I discovered I had been working on a back-up file that wasn't the most recent. Swapped files and I was good to go. Thank god I have been pretty well disciplined about back-ups. Had no idea how quickly you can forget some of the everyday stuff in the toolset when you don't use it. The good news is that with the long weekend for King's b'day, I had a chance to spend some quality time with the mod. It was very frustrating at first - but it was mostly just stupid little things I forgot - i.e. "oh you have to import companion scripts. No wonder my new companion would seem to join the party but then refuse to follow me"! It is actually kind of funny now looking back. This morning I did a play through of what I have so far, taking notes as I went. The Mod plays at about 2 hours currently - assuming you do everything possible (which is not necessary to complete the Mod). Then managed to forge ahead a little. I have almost all of the critical plot elements at least sketched out. All of the external areas are now functioning with the world map though I still have to create about 50% of the custom load screens. Now there is a lot of conversation writing to do, not to mention a few key areas yet to be developed. It feels great to be back on track. Forgot how addicting this stuff can be! Wanted to say "Merry Christmas" to everyone! Here in Genoa Illinois it is certainly a white Christmas. A gentle snow fell all day yesterday, and the weather folks are saying more on the way for today. I drew the illustration above over 30 years ago! 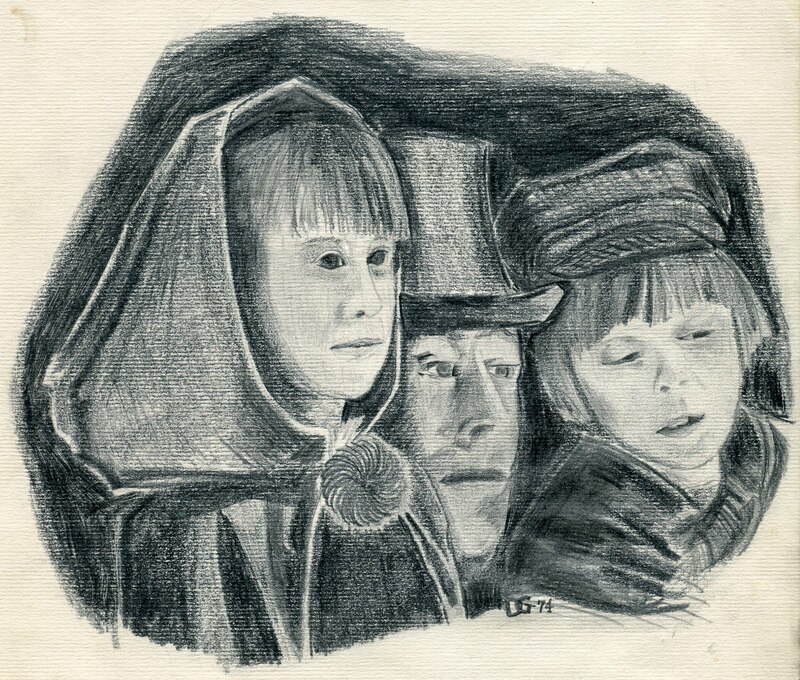 It is based on "A Christmas Carol" - I did it after seeing the movie "Scrooge" which is the musical version of the Dickens story. Time certainly does fly. I hope you all are safe, warm, and with the ones you love. Those are the only gifts anyone really needs. There is a line from one of my favorite holiday movies, "The Bishop's Wife", where a bind man says to Cary Grant "I have hopes". That is how I feel - I have hopes that some day this mod will actually be finished! In that spirit, and facing the reality that it probably will not be until this time next year (at the rate I'm going), that I decided to experiment with a new look for my screen shots. Make them a bit more festive and seasonal. It is, after all, called "Winter Promises. Hope you like the look. Some folks have asked which one I am in the photo in the previous post. FYI - I am the bearded "old fart" on the right. Quite a few of you have expressed interest in my nusic, so I thought i would share the good news. 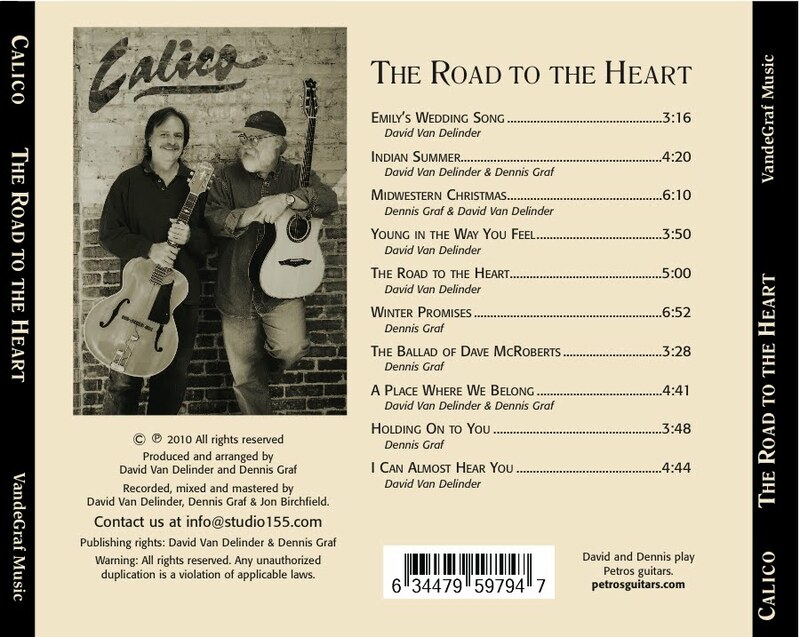 My singer songwriting partner (David Van Delinder) and I have finally released our second CD - "Road to the Heart". It is available now on CDbaby. Should arrive at Itunes soon. We issued a pre-release signed version a few years back, but were never happy with it. This was the first album we recorded entirely in our basement studios, and between the time we started, and the time we "finished", much had changed. We had new equipment, new software, and of course, new knowledge. So we revisted the tracks, redoing vocals, in some cases redoing whole songs, and changed out one song for another. I think it was worth the time and effort. You can hear the sample tracks on CDbaby here. The full version of "Winter Promises" is on the CD. 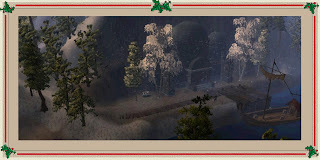 There are also 2 "fantastic" (IMHO) Christmas songs, "A place where I belong", as well as "Midwestern Christmas". So give it a listen. If you like what you hear, whether you purchase or not, please leave a review - we would really appreciate it. Have actually started working on the mod some - its taking a while to get back into the swing of things, but with the season's first real snow hitting today, its definately putting me in the mood. Hope everyone has a fantastic Holiday season! Figured I should update since its been a while. Had a minor setback with a crash - however all is well and most of the work was recovered successfully. Have not has much time to work on the Mod. Hope to get back to it this winter. Being a social service provider in the State of Illinois means funding is short, and when payments from the state are late, things get tense rapidly. What little free time I have has been spent on the music side of things. Its great therapy, and in times like these it keeps me going. Wanted to also share my new web site. It focuses mostly on the music, so if you liked "Winter Promises", and would like to hear more, give me a visit here. I have posted some finished songs, as well as a few "works in progress". 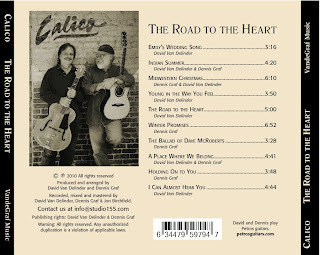 David and I (David Van Delinder - mu partner in "crime") are just about to release our second cd, "Road to the heart". It should be on Cdbaby in a few weeks, and Itunes shortly thereafter. Hope you like what you hear! Managed to pull myself away from the olympics for a while. Ran into a mental block while wrestling with one of the plot twists, so I decided to tackle something I have been meaning to get to for a while - custom load screens. Came up with a few very basic designs and then dashed off into the toolset to set them up, and test. Many thanks to those of you who have "gone before". I would have never figured this out on my own! While there is still a lot of experimenting to do before I get just the feel I am after, it is always a gas to see things functioning "in game" as they are supposed to. 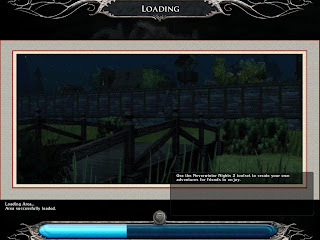 Initially, I had the screens loading properly the first time, but then failing when I returned to an area. Turned out to be an error in the way I was saving them (24 bit vs 16 bit tga files). Once I sorted that out (16 is the way to go), all was smooth sailing. 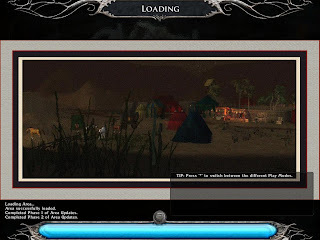 Have included 2 variant of the screens captured "in game". If you would like to know more about my music and other "stuff", this is the place to go. I update the blog fairly regularly, and also include music streams of various works in progress ranging from older unpublished songs to drafts of new material. Hope you stop by. Just click on the link "My Music, My Life" below. I am an administrator of a child welfare agency. I am also a musician, and songwriter. These monthly updates working for you?